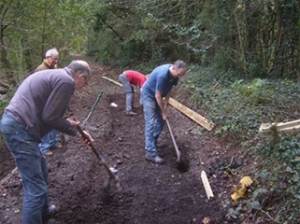 We rely on volunteers to care for the Bollin if you’re interested in helping out throughtout the year please register your interest below. By completing the form below you will also be subscribed to our newsletter. 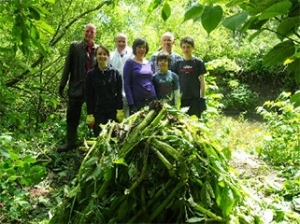 A major focus of FOBB’s Volunteer Group has been tackling the non-native invasive species – Himalayan Balsam, Giant Hogweed and Japanese Knotweed – which are taking over the land beside the Bowdon Bollin to the detriment of local wild flowers. 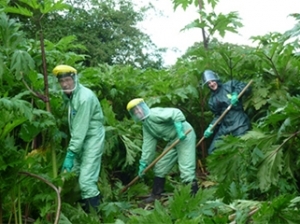 As well as excluding native species, Balsam worsens riverbank erosion and Giant Hogweed sap can burn skin on contact. Japanese Knotweed, which can reproduce from every part of itself, is also spreading in this area. FOBB is involved with BEACON (Bollin Environmental Action and Conservation), who have been funded by DEFRA, to raise awareness and control these species in the Bollin catchment area (from Macclesfield forest to the Manchester Ship Canal). Typically grows to heights of 2-5m (6.7-18.1ft) & causes severe burning when in contact with the skin and exposed to sunlight, (potentially life-long scarring and blindness) making our local fields especially dangerous to children and pets. In addition, it is crowding out indigenous species and destroying wildlife habitat, (each one produces 1,500 to 100,000 seeds). Avoid contact with this plant. Typically grows 1-2m (3.3-6.5ft) high with soft red-tinged green stems and from June to October pink flowers, which explode scattering seeds up to 7m (23ft). This tremendously vigorous plant out-competes indigenous flora and then dies back in winter leaving river banks prone to erosion leading to bank subsidence. Please pull it up whenever you see it. Our Community Spaces grant funded 3 training days with the Trust for Conservation Volunteers (TCV). 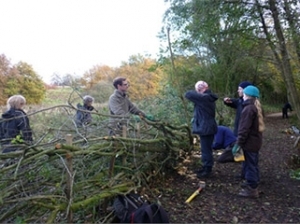 FOBB volunteers learnt hedge-laying and tree pruning skills as well as how to lay and edge paths. We were also joined by Sale and Altrincham Conservation Volunteers (SACV) for a hedge-laying day. We always need more volunteers so please help us if you can. See our Calendar or contact us to join our Volunteer Group email list where reminders of activities will be posted.